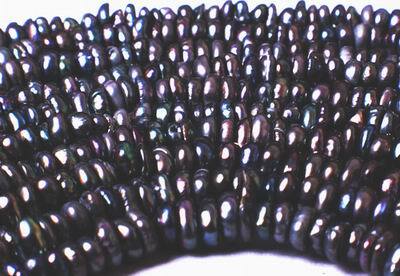 Price is per 14.5-inch strand of these beautiful freshwater pearls. Each pearl measures about 4mm x 2mm. Although they are small, there are many on the strand! China has the resources that Japan lacks: many large lakes, rivers, and a low-cost work force. The first Chinese cultured pearls were basic, until the 1990's when China revolutionized pearling. Shapes, luster, and colors of the new Chinese pearls now surpass Biwa.